Does anyone else think brand promotions have become a bit stale? I don’t need another pen, loyalty cards get lost and I delete discount emails without a second thought. But, I wouldn’t turn my back on a free phone. Thanks Taco Bell. 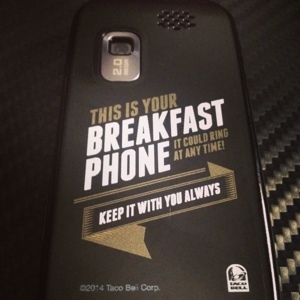 To celebrate the restaurant chain’s move into the breakfast market next week, Taco Bell has sent fans free phones (Samsung to be precise.It gets around doesn’t it?) that include instructions for consumers to take part in missions to win prizes. In fact, the missions are so secretive there’s little information on how it works. What I do know is that social media is a key trigger for the campaign. Upon accepting the mission – by turning the device on – they’re asked to submit their Twitter and Instagram handles and post images for the chance to win anything from a branded air freshener and pajamas to gift cards and a trip to the Pacific. But I’d be no good at this competition. My phone is always on silent – but Taco Bell’s phones were sent to fans with a note stating that it could ring at any time – so it should be kept with them at all times, even while they sleep. Fans should be made aware that it pays to think outside of the box. Points are awarded based on each photo’s creativity, originality, whether it links with the promotion theme and the Taco Bell brand. This is a brilliant campaign because it transforms fans into ambassadors, driving them to promote the breakfast offering in a fresh way, generating content while reaching millions of potential customers. It’s so good it should be its PR mission statement. The phones went live yesterday so the fun has only just begun. We’re bound to see lots of photos stamped with the #breakfastphone hashtag over the next week when the breakfast offer launches next Thursday in the US. What do you think? Is Taco Bell too hungry to make its morning menu work?